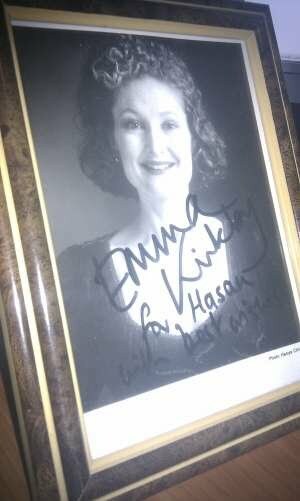 Inspired by this wonderful post by Monica Bowen at Alberti's Window on composer G.F. Handel as an art collector, I'd like to present these clips of the eminent soprano Emma Kirkby. 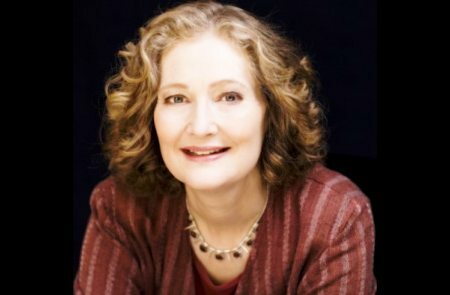 Perhaps known to some for her performances of Handel's Messiah, Emma Kirkby has also become an iconic performer of Renaissance and Baroque vocal music from all corners of Europe. 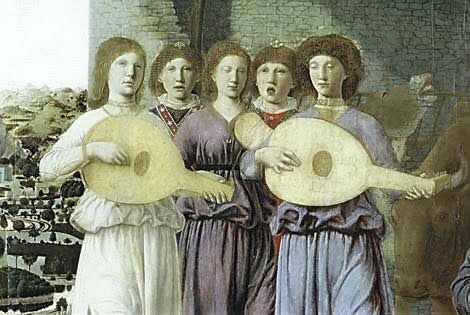 Five Emma Kirkbys: Journalist Fiona Maddocks famously commented that Emma Kirkby happenned to look like the angels from this 1470 Piero Della Francesca Nativity - and that such a look was a useful thing for a Renaissance singer to have! As much as I love Emma's voice, I am not musical myself so can not comment on the technical nuances of her voice or her subject matter. What I can suggest is that you watch/listen to the clips below and see if Emma's voice and story appeals to you. As an appetiser, and illustration of Emma's amazing versatility, listen to this performance taken from Elizabethan composer John Downland's Collected Works, performed by the Consort of Musicke. 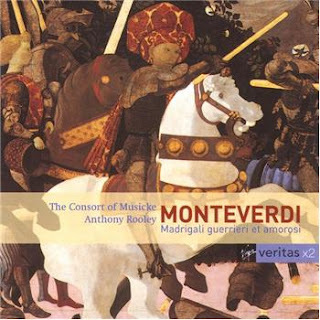 Effortlessly moving from the Elizabethan era to the Italian Renaissance and Early Baroque, one of Emma's landmark performances is of Claudio Monteverdi's (1567-1643) amazing Lamento della Ninfa (The Nymph's Lament), which is taken from the Eighth Book of Madrigals - whose themes were war and love (Madrigale guerrieri et amorosi). This particular clip is from the 1999 release by the Consorte of Musicke. It is set to the paintings of Lavinia Fontana (1552-1614), a sixteenth century female painter from Bologna. Sadly, Lavinia herself may not have heard the The Nymph's Lament as she died in around the time poet and librettist Ottavio Rinuccini (1562-1621) is believed to have written the canonzetta on which the Lamento della Ninfa is based. Interestingly, it was also Rinuccini who contributed the verses of the Intermedi which were featured in the famous Medici wedding of 1589 - as featured in this earlier post. Please find below a transcript and translation of the lyrics - which were taken from the CD liner notes. Linguistic nitpickers will need to take it up with the music publishers and not me if there are any errors in spelling and translation of the Italian! The male voices recurringly sing the words written in italics. may no longer torment myself." Much to the delight of her fans worldwide, Emma was awarded a DCE(Dame Commander of The Empire) in the 2007 Queen's Birthday Honours list. Coinciding with this was her appearance on the The South Bank Show on ITV UK in 2007. This program is a rare treat, as it is not available for purchase. Hosted by Melvyn Bragg(whom some may recognise from the In Our Time podcasts), it traces Emma's career through interviews and performances. Parts 2-6 focus on the Italian and English Renaissance and Baroque music in particular - with part five including a wonderful live performance of Lamento della Ninfa in Italy. Great post! I especially loved the comparison between Kirkby and the angels in Piero della Francesca's painting. What an observant journalist! I've really enjoyed becoming more familiar with Kirkby, since we started up a conversation about her last week. Her music and voice are truly inspiring. Cheers M! How wonderful that you enjoyed hearing more of Emma Kirkby. I can not imagine a world without her amazing voice. I really love Emma's modesty when she describes her status and fame (as you see in part 6 of the documentary). She seems to think that some of her fans may not like her as much if she was as wildly popular as some of the other Sopranos who are more famous more their bombastic trilling. I think there is a kernel of truth to this in that were it not for her early music speciality, she would have been one of many other sopranos singing the same popular pieces, and not as readily noticed among them. She has done a lot to promote early music, in her releases and in teaching - which was what garnered her the DCE.